There are a lot of people who are looking for their next career opportunity. Either they left their previous companies and are in transition or they have outgrown their current role and are looking for a new challenge. Possibly both. Perhaps your are one of them. Or maybe things are humming along nicely for you at work, but you don’t want to get stale or forget your own development as you grow in place or seek promotion. Thinking about this in my own experience has led to me to some insights that might be useful to you. Once getting approval to hire, the manager wants to make a smart hiring choice. They know that unless you have someone in the role who is highly productive in short order, they won’t be successful. Hiring a warm body isn’t enough. They want a candidate with the elusive combination of past experience, personal motivation, and future potential that will allow them to fill their need (see #1). Anything misstep in this search and they might be stuck with a bad performer (worst case scenario), have to swap out talent (losing more time), and damage their reputation as a leader and team builder in the process. All of these things are out of the question. The stakes are high to find the steak knife (see what I did there?). So, they go on the hunt for the perfect candidate for their role and you want them to find you in their search, so let’s switch focus to you. You are an experienced, successful professional in your field. You have done some amazing things. You have more capabilities, more raw potential, and undoubtedly more experience than your next job can fully appreciate. That is okay. It is preferred. Otherwise, you’d go into a role that would immediately bore you or to which you couldn’t apply your diverse background to make it your own. If you are not clear on what you want in your next role, you will confuse a hiring manager. They want a steak knife. You are a Swiss Army Knife. If you go on about all the things you can do (“I can uncork wine, pop bottle caps, open tin cans, and cut fingernails, and have experience cutting pork chops, cheese, and Duct Tape”), you aren’t going to jump out as the obvious choice to a would-be hiring manager. Plus, everyone describes themselves the same way. You have to stand out. Sure, the company probably does need a well-rounded athlete (more on that later), but they are recruiting for a runner, cyclist, or swimmer, not all three. Even the accomplished triathlete has an area of strength. So do you. If you are honest with yourself, there are parts of your past experience that have been sources of joy and energy and things you have done (perhaps even done exceptionally well) that drain you of energy and motivation. Only you know for sure, although others can provide some useful insight you might be too close to see yourself. You can use assessment tools (like StrengthsFinders, Insights Discovery Kolbe, DiSC, Myers-Briggs, Enneagram, and others) to gain insight. You can hire a career coach to ask you better questions than you are asking yourself. You can read books. You can seek counsel from networking groups or colleagues. You can take a self-discovery or professional development class. You can spend time with yourself. However it happens, you need to get clear about what you want and get good at describing your differentiation. What you do best. Not what you have done, but what you want to do in the future. What skills you want to use, what kind of role you want, what kind of company would suit best (by name preferably), what title would suit, and how you want to be measured and managed. This is essentially your personal marketing plan. It is highly likely that the job requires some things you haven’t done, or done in a while, or done well. That is just the nature of the dynamic, changing nature of the workforce. Technology, competitive pressures, globalization, and other trends are causing jobs to change rapidly. Sure, you can invest in training and certifications (you should!). You keep up on your industry. You join networking groups. You do some mentoring and reverse mentoring to stay current. All those things are important, but likely you will need to make some effort, starting in an interview process and through onboarding, to translate what you have done as transferrable skills to the role. And for the rest, you and the hiring manager will need to develop a plan (more on this in a second). The manager will need to be incredibly crisp on the non-negotiables for the role; the personality traits, motivations, and skills that translate to success in the role. Notice I didn’t say “experience.” Experience may not be a measure of future performance in the role and, frankly, as a manager is a really hard to differentiate on experience since everyone who applies and makes it through initial screening seems incredibly and equally competent. Looking at these things visually, each candidate has a certain degree of overlap with the success profile of the role they are applying for. The overlap are the familiar responsibilities, personality traits, motivations, and skills that the job requires that you can confidently accomplish. Both hiring manager and candidates are well-served by having a high degree of overlap. 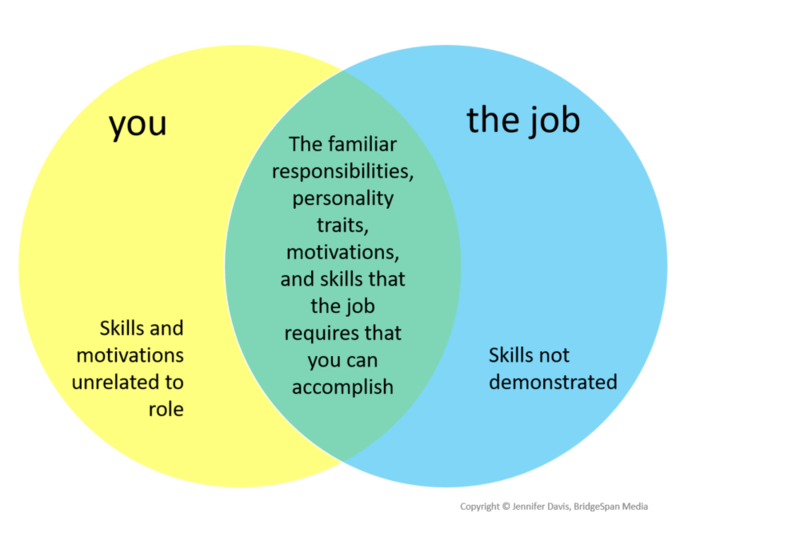 Or, ideally, you will find a way to shift the role definition itself (the edge of the job profile circle) to the left to encompass more of your skills. Let’s say you join the company as an individual contributor, but have management experience. Perhaps as the company and role grows, you can take over a team and be a people manager again to use those skills. Perhaps you can look for ways to expand the scope to cover things you are developing in yourself, like strategic thinking, new technical skills, or leadership. Development: you could learn and practice the skills required to be good at your new (next) job. Delegate: you could bring people onto your team who are experts in these areas to do the work and for you to learn from. Design: you and your manager could actually design these tasks out of the job itself, giving them to another person or group, shifting your role to play to your strengths. The alternatives to these things also start with D: disappoint and disaster. Let’s try to avoid that with some frank discussion and good planning and organization design at the start. In the past, I have found that having people on my team who could help me follow-up on detailed accountability plans was a useful corollary to my strategy and idea-generating creativity. Everyone has strengths and we should use ours and allow others the opportunity to demonstrate theirs. We have all had these things in our jobs in the past that we either had to get good at or find ways to accomplish in other ways. Finally, if you are finding success and satisfaction in your job and want to continue to moving forward, these are still great principles to apply. Keeping up on trends in the job market, understanding the career pathing at your company, investing in yourself with additional reading, courses, and experiences, and talking with trusted mentors and advisors can help you continue to develop your skills and capabilities to be a high degree of overlap for your next role. And one last note: Everyone can use a good activist shareholder on their personal board of directors (don’t know what an activist investor is? See here). You should have people in your life that are asking the tough questions, making sure you are growing, and sponsoring you for stretch roles. It may be uncomfortable to invite a disrupter or agitator into your inner circle, but it is necessary to combat complacency and avoid developing blind spots around your own development. If you don’t have an activist among your career advisors, find one. Special thanks to Richard Banks for introducing me to personal marketing plans, for Minh-Ha Nguyen and Teresa Caro for helping me filter my own experience more clearly, to Rebecca Larson for helping me articulate my strengths, to Kelly Kannwischer for Younique and Susan Clark for HeartSpark, to Mike Allred at TechCXO for the Enneagram-based Print Report, to Brian Scudamore and Vistage for introducing me to Kolbe, Alyssa Gasca, Michele Sarkisian, Tanya Young Stump, Gina Riley, Balaji Krishnamurthy, Ben Clifton, and Herve Fage for being activists to me, to Sarah Carr Evans and Kevin Hickey for recently dissecting job success profiles for me, and for so many of my LinkedIn connections, friends, and colleagues for your help and encouragement in my own professional journey. So grateful for their investment in me and I hope that I have done a few things to make them proud (mistakes and opinions my own, of course).